The State Collaborative on Reforming Education (SCORE) today announced it is launching the Tennessee Educator Fellowship, a program that will provide Tennessee teachers an opportunity to have a greater impact on key state-level education policy issues. The Tennessee Educator Fellows will be led by Tennessee teacher Cicely Woodard. Woodard brings over 11 years of classroom experience to this role. 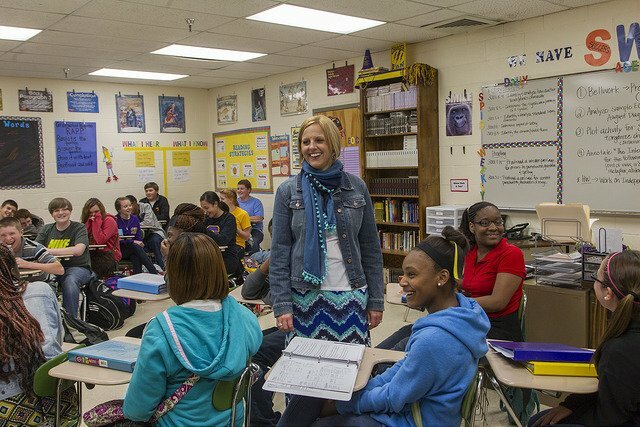 An eighth-grade math teacher at Rose Park Math and Science Magnet in Metro Nashville Public Schools, she also served as a teacher leader supporting, training, and coaching teachers across Tennessee and has testified before numerous legislative hearings at the request of education committee leadership. SCORE, a nonpartisan, nonprofit education research and advocacy group founded by former U.S. Senate Majority Leader Bill Frist, will select approximately 20 classroom teachers to serve a one-year term. The fellows will learn about, reflect upon, inform, and advocate for policies, practices, and systems that impact educator effectiveness and student achievement. Fellows representing each of Tennessee’s three geographic divisions will be chosen from varying subjects and grade levels. Each fellow will continue as a full-time teacher during the term and will receive a stipend. “Teachers bring a critically important perspective to speak to the progress our students have made, to help identify the obstacles that stand in the way of ensuring all students graduate ready for college and career, and to advocate for adjustments and improvements that still are needed,” Woodson said. After receiving training in education policy issues, the fellows will work to inform policymakers and their communities about issues affecting students and teachers and to provide feedback to SCORE for the development of statewide education priorities. Most important, the teachers who join the Tennessee Educator Fellowship will provide a clear, consistent, and student-focused voice as Tennessee works to ensure all students graduate from high school prepared for the future. Woodard began her education career in 2003 at Rose Park after earning a bachelor’s of mathematical sciences from the University of Memphis and a master’s of education from Vanderbilt University. She also has led professional learning communities of teachers, facilitated numerous workshops on teaching mathematics, and served as a Tennessee Common Core Coach for Algebra I. The Tennessee Educator Fellowship is open to Tennessee public school teachers with at least three years of classroom experience. Applications for the 2014-15 program must be submitted by July 18 at http://bit.ly/TNEducatorFellowship.